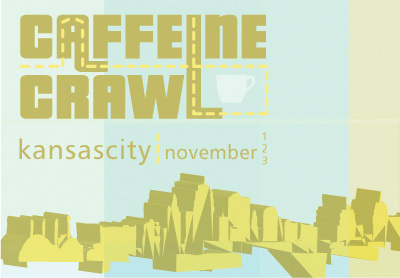 Caffeine Crawl 2013 culminated in a high-energy weekend for Kansas City, with 24 coffee, tea, and chocolate businesses participating, 280+ Crawlers slurping, munching, and tweeting through their routes, and 3 full days of caffeinated fun finished by Barista Nation KC. Perfect Crema sponsor InterAmerican Coffee was well represented by Guy and Josh Burdett. Other sponsors who participated were Joe and David from Sleeve a Message and Blaine from Regal, while Kate from Roaster Sponsor Parisi Artisan Coffee was a tour guide. Zachary from Sprudge.com attended all 3 Crawls as well (read his articles here) and Panda from Espresso Parts lent his dynamic presence to our Sunday Crawl, documenting as he drank. After six months of preparation, The LAB team was eager to get started on Friday night, November 1st. Crawlers visited Foo’s Fabulous Custard, where we saturated our tastebuds in a delicious vanilla custard affogato topped by a Christopher Elbow ganache. Tanner & Cory from Quay Coffee gave an innovative presentation on how filters impact coffee taste, using metal, fabric, and paper filters. Tim, with Shang Tea at the Crown Center, gave us an informative presentation on the processes that help craft quality tea, while owner Shang poured us several varieties to taste. At Mud Pie we lost all sense of decorum and stuffed ourselves with delicious vegan baked goods, followed by samples of various non-dairy milks for comparison. At Co-Roaster Sponsor Oddly Correct, home of current South Central Barista Champion Tyler Rovenstine, owner Gregory gave a clear and elegant presentation on coffee processes with a focus on the hands that touch it, farm to cup. Stacy at One More Cup had a quirky presentation, complete with a 90’s-style zine, on the history of coffeehouses. Saturday’s Crawl started out at About The Coffee (ATC), with three presentations for Crawlers. Jeff Taylor from Co-Roaster Sponsor PT’s Coffee presented on their direct trade relationship with the Elida Estate in Panama, while Tootie and Sadie from ATC treated Crawlers to steaming Chemexes in the cold morning and Marty explained the unique extraction process involved in the Siphon. From there, we all loaded buses and drove around the metro area drinking coffee and making new friends. Jalene at Crossroads Coffeehouse treated us to a caramel apple toddy using PT’s coffee, accompanied by pretzel bread and the best cheddar beer soup we’d ever had. Benetti’s topped their over-the-top presentations at the last 2 KC Crawls by bringing Indonesian importer Sudibyo to Raytown to present on the unique challenges and processes inherent in working with Sumatran coffees. The Filling Station nailed it with three specials for Crawlers: a bourbon-infused toddy latte, vegan affogato, and a spicy ginger-kale juice. At Broadway Café we tasted two coffees and chocolate in a variety of treats: straight up French press, a delectable sweetened chocolate toddy, and chocolate coffee-infused cookies. Being handed ½-lb bags of coffee on our way out the door was a definite highlight! It was the day for chocolate, because Annedore’s Fine Chocolate and Hi Hat shared a stop with (and in no particular order) vegan brownies, chocolate chip scones, chocolate ganache, and Mexican hot chocolate, and a couple goodies to take home. Christopher Elbow also earned our chocolate love with coffee caramel ice cream and chocolate to take home. What a day. Sunday kicked off cold and windy. At Homer’s Coffeehouse, Stubbie, the charismatic roaster behind E. F. Hobbs, presented on supertasters (complete with blue dye) while a jazz band welcomed Crawlers. Crawlers learned about processing methods at The Roasterie’s stunning facility, while meeting the new Green Buyer, John Ferguson of Cultiva and Dogwood fame. The folks at State Line Latte Land (soon to be Kaldi’s) offered us an opportunity to get our hands dirty and partner with their instructors to brew Clever coffee at five stations, also giving us some delicious whole-bean coffee. Kate and the team at Co-Roaster Sponsor Parisi in Leawood had set up a full-on cupping for us, with coffees from her recent stint as a judge in the Rwandan Cup of Excellence. The potato defect blew us away, and it was fun to see first-time cuppers feeling it out. After all the coffee, the artisan toast and coffee pairings at Black Dog were very welcome, with many Crawlers buying toast to go so their moment of bliss could continue. Habte and his family welcomed us at RevoCup with a presentation on Ethiopian coffee and a discussion of how they are changing lives by giving back in the form of libraries for their fellow Ethiopians. The weekend concluded with the last Barista Nation event in 2013, pulling industry professionals from around the country. Many highlights, but one was a well-organized latte art throwdown (thanks Kate!) on two beautiful Unic machines, set to music by DJ Sprudge. It’s hard to label happiness, but we felt it as we watched our year of Crawls come to a close with lip syncing, air guitar, and father-daughter Bhakti Chai hats. It’s been a crazy ride, Crawlers, sponsors, and shops, and we can’t wait to dive in to 2014 with you!